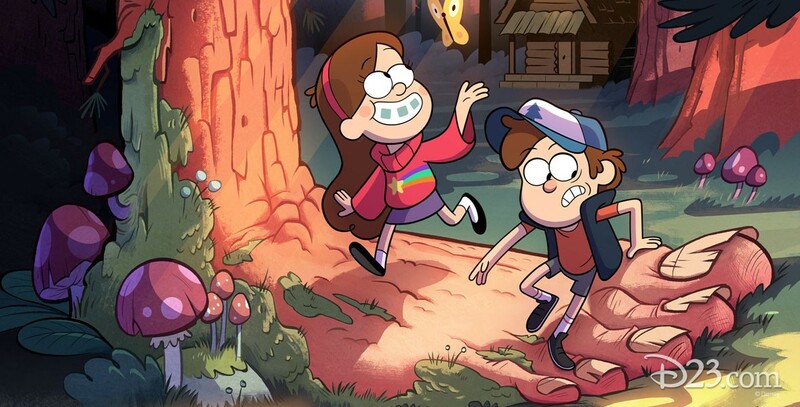 Gravity Falls (television) Animated series premiering on Disney Channel on June 15, 2012. Twin brother and sister, Dipper and Mabel Pines, are in for an unexpected adventure when they spend the summer with their great uncle Stan in the weird town of Gravity Falls, Oregon. Upon their arrival, Dipper and Mabel’s huckster great uncle, also known as Grunkle Stan, enlists the siblings’ help in running The Mystery Shack, a fun tourist trap he owns that overcharges unsuspecting customers. Although the kids quickly discover The Mystery Shack itself is a hoax, they sense there is something strange about their new town and they attempt to unlock the secrets. Voices include Jason Ritter (Dipper Pines), Kristen Schaal (Mabel Pines), Alex Hirsch (Stan/Soos), Linda Cardellini (Wendy). Created by Alex Hirsch; from Disney Television Animation. Two shorts, Mabel’s Scrapbook: Heist Movie and Mabel’s Scrapbook: Petting Zoo, aired on Disney XD in 2014, prior to the series moving to that cable channel for its second season.